Nephron damage associated with CKD is irreversible and often progressive. Nephrocalcinosis, systemic hypertension, intraglomerular hypertension, and proteinuria have been associated with progression of CKD.6-9 All of these mechanisms of renal disease progression are potentially treatable. The International Renal Interest Society provides guidelines for both staging and treatment of canine and feline CKD, which are available at iris-kidney.com/guidelines/staging.aspx and iris-kidney.com/guidelines/recommendations.aspx, respectively. Decreases in glomerular filtration rate (GFR) due to renal disease. Plasma clearance techniques (eg, iohexol plasma clearance) that do not require collection of urine have led to simplified measurement of GFR in recent years. However, due to expense, time, and labor, GFR is rarely measured in the practice setting. Serum creatinine (sCr) concentrations are commonly used as a surrogate for GFR because they have an inverse relationship. In early CKD, relatively large changes in GFR are associated with small changes in sCr concentration, while the opposite is true in later stages of CKD. Unfortunately, this relationship is not linear (Figure 1), which limits the sensitivity of sCr for detection of early renal disease. FIGURE 1. 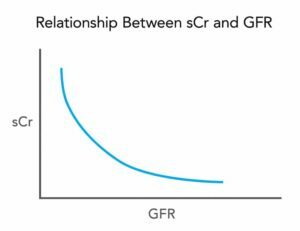 Curvilinear inverse relationship between serum creatinine (sCr) and glomerular filtration rate (GFR). 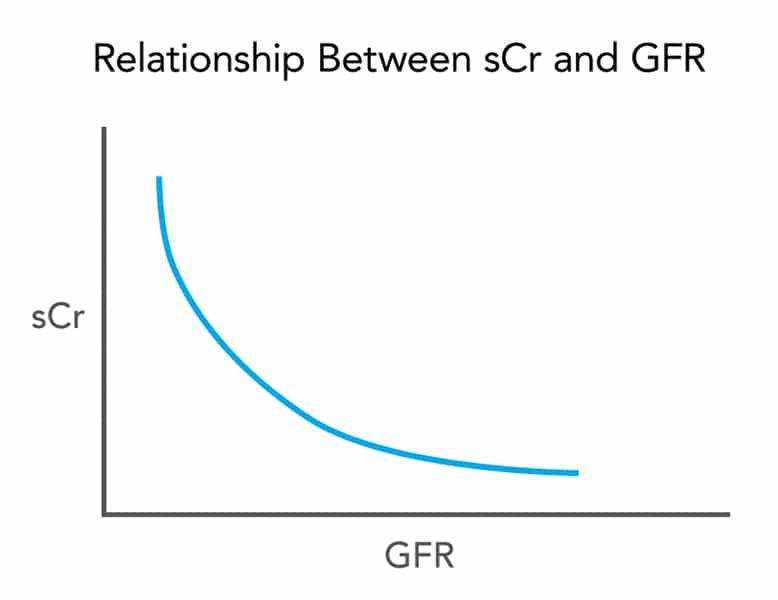 Note that, on the right side of the graph, relatively large reductions in GFR result in only minor changes in sCr, while the opposite relationship is demonstrated at the top of the graph. In addition, because creatinine is derived from skeletal muscle, sCr concentrations reflect patient muscle mass as well as renal excretory function. It is well known that highly muscled breeds, such as greyhounds, have higher sCr concentrations than do breeds with less muscle. Renal function may be overestimated in aging animals with reduced muscle mass and, therefore, reduced sCr concentrations. Interpretation of sCr concentrations can also be influenced by the method of analysis (Jaffe reaction versus enzymatic reaction; benchtop versus reference laboratory). Comparing sCr concentrations from the same patient when more than one laboratory or method is involved does not always provide an “apples to apples” comparison. A sCr concentration of 1.4 mg/dL or greater in a dog or 1.6 mg/dL or greater in a cat does not necessarily indicate azotemia, but it does suggest that the patient should be monitored more closely. 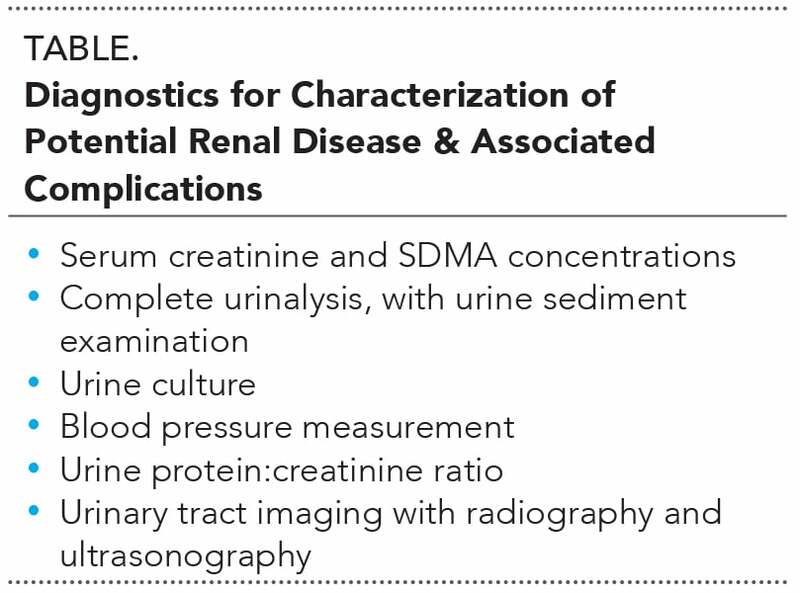 sCr concentrations must always be interpreted in light of the patient’s muscle mass, urine specific gravity (USG), and physical examination findings in order to rule out volume-responsive and postrenal causes of azotemia. For example, a high normal sCr concentration in an older cat with loss of muscle mass may indicate decreased renal excretory function. Conversely, a high sCr concentration in a dehydrated dog with a USG of 1.040 would suggest prerenal azotemia. Despite all these potential pitfalls, longitudinal assessment of sCr concentrations (analyzed by consistent methods) is an excellent tool to assess renal function and diagnose early CKD. For example, a sCr concentration that increases from 0.7 to 1.4 mg/dL over several years in a patient without evidence of dehydration or an increase in muscle mass could indicate a minimum 50% reduction in GFR. The reduction in renal function may be greater than 50% due to compensatory hypertrophy of remaining nephrons. Increases in sCr of at least 0.3 mg/dL are more than would be expected with normal assay variation when the same method is used. SDMA is derived from intranuclear methylation of L-arginine by protein-arginine methyltransferases; it is released into the blood after proteolysis. SDMA is eliminated primarily by glomerular filtration and is not affected by tubular reabsorption or secretion. Therefore, it can be used as an intrinsic GFR marker. Recently, SDMA has received attention in veterinary medicine as a kidney excretory function biomarker. FIGURE 2. 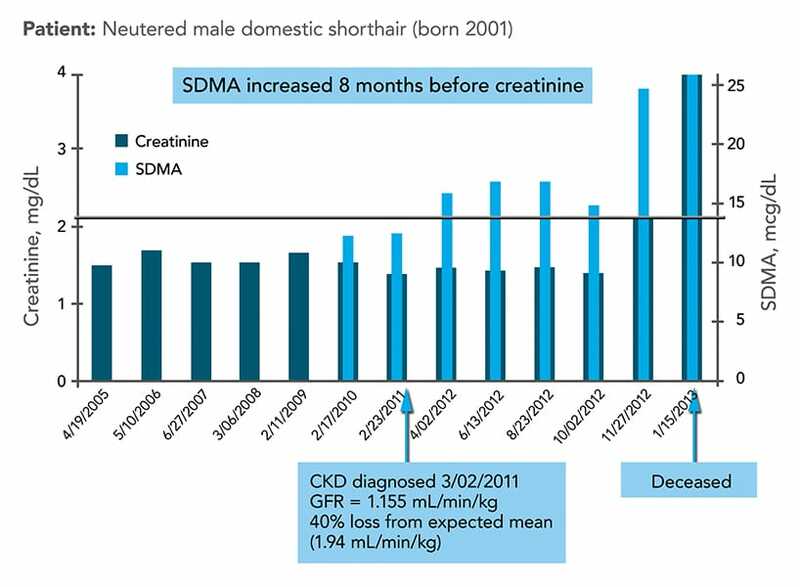 Serum creatinine (sCr) and serum symmetric dimethylarginine (SDMA) concentrations over time in a cat that developed chronic kidney disease (CKD). SDMA increased above the reference interval approximately 8 months earlier than sCr. The horizontal line is the upper limit of the laboratory’s reference interval for both SDMA (> 14 mcg/dL) and feline sCr (> 2.1 mg/dL). 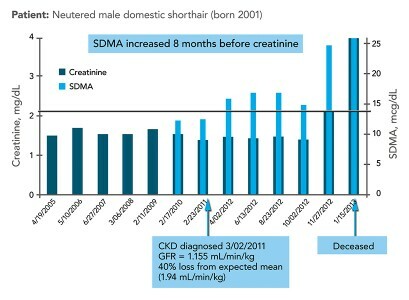 On 4/02/2012, when the SDMA increased above the reference interval, GFR had decreased approximately 40% from the expected mean. Note that, although the laboratory’s normal reference interval for sCr was < 2.1 mg/dL, a tighter reference interval for sCr (eg, < 1.6 mg/dL) would have decreased the 8 month disparity. Dogs and cats with IRIS stage 1 CKD may not progress to stage 2; however, they are at risk for progression of kidney disease. Dogs and cats with stage 1 CKD warrant increased monitoring in order to assess the stability or progression of their kidney disease. There are no prospective, controlled clinical trials that demonstrate efficacy of any renoprotective treatments for stage 1 CKD. Renoprotective treatments, such as dietary modification and enteric phosphate binders, are typically initiated in iris stage 2 CKD. In patients with IRIS stage 2 CKD who have low body condition scores and SDMA concentrations of 25 mcg/dl or greater, the sCR may have led to an underestimation of renal function; IRIS stage 3 CKD treatment recommendations may need to be considered. Similarly, in patients with IRIS stage 3 CKD who have low body condition scores and SDMA concentrations of 40 mcg/dl or greater, the sCr may have led to an underestimation of renal function; iris stage 4 CKD treatment recommendations may need to be considered. On the basis of the preceding studies, it appears that compared with sCr, SDMA is a more sensitive renal function biomarker, and can facilitate early diagnosis and treatment of CKD. A persistent elevation in SDMA (> 14 mcg/dL), accompanied by an isosthenuric USG, even if sCr levels are less than 1.4 mg/dL or 1.6 mg/dL in dogs and cats, respectively, indicates reduced renal function and IRIS stage 1 CKD. Similar to sCr, SDMA needs to be interpreted in light of hydration status and physical examination findings. For example, a dehydrated dog or cat with a SDMA concentration of 16 mcg/dL and a USG of > 1.040 likely has prerenal azotemia. In contrast to sCr, SDMA should not be affected by changes in muscle mass. Then approximately every 3 months to assess renal function stability. 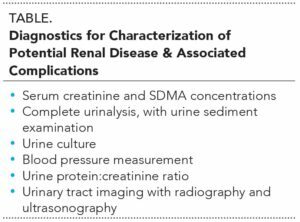 Additional tests that may help further characterize potential renal disease and associated complications are listed in the Table. Bacterial pyelonephritis, partial or complete ureteral obstruction, hypertension, and proteinuria are all potentially treatable causes or complications of CKD. Serum SDMA concentrations greater than 14 mcg/dL. Longitudinal assessment of these measures almost always provides better data than one-time evaluations. No single laboratory test is perfect; trending laboratory data, with the same test method, tends to improve diagnostic sensitivity. Serum SDMA concentration is now included in all routine IDEXX Reference Laboratories (idexx.com) serum biochemistry panels, with concentrations greater than 14 mcg/dL considered abnormal in both dogs and cats. Similar to sCr, results from SDMA analysis must always be interpreted in light of patient USG and physical examination findings in order to rule out volume-responsive and postrenal causes of azotemia. In addition, longitudinal assessment of serum SDMA concentrations is preferred over one-time assessments. The author has participated in research projects funded by IDEXX Laboratories (idexx.com) and has been paid by IDEXX to attend conferences/meetings as a key opinion leader. Lund EM, Armstrong JP, Kirk CA, et al. Health status and population characteristics of dog and cats examined at private veterinary practices in the United States. JAVMA 1999; 214:1336-1341. Brown SA. Linking treatment to staging in chronic kidney disease. In August JR (ed): Consultations in Feline Internal Medicine. St. Louis: Elsevier Saunders, 2010, pp 475-482. Polzin DJ, Osborne CA, Adams LG, Lulich JP. Medical management of feline chronic renal failure. In Kirk RW, Bonagura JD (eds): Kirk’s Current Veterinary Therapy XI. Philadelphia: Saunders, 1992, pp 848-853. Ross SJ, Polzin DJ, Osborne CA. Clinical progression of early chronic renal failure and implications for management. In August JR (ed): Consultations in Feline Internal Medicine. St Louis: Elsevier Saunders, 2005, pp 389-398. Lulich JP, Osborne CA, O’Brien TD, et al. Feline renal failure: Questions, answers, questions. Compend Cont Educ Pract Vet 1992; 14:127-153. Chakrabarti S, Syme HM, Elliott J. Clinicopathological variables predicting progression of azotemia in cats with chronic kidney disease. J Vet Intern Med 2012; 26:275-281. Jacob F, Polzin DJ, Osborne CA, et al. Association between initial systolic blood pressure and risk of developing a uremic crisis or of dying in dogs with chronic renal failure. JAVMA 2003; 222:322-329. Jacob F, Polzin DJ, Osborne CA, et al. Evaluation of the association between initial proteinuria and morbidity rate or death in dogs with naturally occurring chronic renal failure. JAVMA 2005; 226:393-400. Syme HM, Markwell PJ, Pfeiffer D, Elliott J. Survival of cats with naturally occurring chronic renal failure is related to severity of proteinuria. J Vet Intern Med 2006; 20:528-535. Elliott J, Rawlings JM, Markwell PJ, Barber PJ. Survival of cats with naturally occurring chronic renal failure: Effect of dietary management. J Small Anim Pract 2000; 41:235-242. Grauer GF, Greco DS, Getzy DM, et al. Effects of enalapril versus placebo as a treatment for canine idiopathic glomerulonephritis. J Vet Intern Med 2000; 14:526-533. Jacob F, Polzin DJ, Osborne CA, et al. Clinical evaluation of dietary modification for treatment of spontaneous chronic renal failure in dogs. JAVMA 2002; 220:1163-1170. Mizutani H, Koyama H, Watanabe T, et al. Evaluation of the clinical efficacy of benazepril in the treatment of chronic renal insufficiency in cats. J Vet Intern Med 2006; 20:1074-1079. Ross SJ, Osborne CA, Kirk CA, et al. Clinical evaluation of dietary modification for treatment of spontaneous chronic kidney disease in cats. JAVMA 2006; 229:949-957. Ulleberg T, Robben J, Nordahl KM, et al. Plasma creatinine in dogs: Intra- and inter-laboratory variation in 10 European veterinary laboratories. Acta Vet Scand 2011; 53:25-38. Boozer L, Cartier L, Sheldon S, et al. Lack of utility of laboratory “normal” ranges for serum creatinine concentration for the diagnosis of feline chronic renal insufficiency (abstract). J Vet Intern Med 2002; 16:354.
International Renal Interest Society. CKD staging guidelines for dogs and cats. Available at iris-kidney.com/guidelines/staging.aspx. Kielstein JT, Salpeter SR, Bode-Boeger SM, et al. Symmetric dimethylarginine (SDMA) as endogenous marker of renal function—a meta-analysis. Nephrol Dial Transplant 2006; 21:2446-2451. Braff J, Obare E, Yeramiil M, et al. Relationship between serum symmetric dimethylaraginine concentration and glomerular filtration rate in cats. J Vet Intern Med 2014; 28:1699-1701. Hall JE, Yeramilli M, Obare E, et al. Comparison of serum symmetric dimethylarginine and creatinine as kidney function biomarkers in cats with chronic kidney disease. J Vet Intern Med 2014; 28:1676-1683. Yeramilli M, Yeramilli M, Obare E, et al. Symmetric dimethylarginine (SDMA) increases earlier than serum creatinine in dogs with chronic kidney disease (CKD) (abstract). J Vet Intern Med 2014; 28:1084-1085. Nabity MB, Lees GE, Boggess MM, et al. Symmetic dimethylarginine assay validation, stability, and evaluation as a marker for the early detection of chronic kidney disease in dogs. J Vet Intern Med 2015; 29:1036-1044. Hall JA, Yeramilli M, Obare E, et al. Relationship between lean body mass and serum renal biomarkers in healthy dogs. J Vet Intern Med 2015; 29:808-814. Hall JA, Yeramilli M, Obare E, et al. Comparison of serum concentrations of symmetric dimethylarginine and creatinine as kidney function biomarkers in healthy geriatric cats fed reduced protein foods enriched with fish oil, L-carnitine, and medium-chain triglycerides. Vet J 2014; 202:588-596. Rytlewski K, Olszanecki R, Korbut R, Zdebski Z. Effects of prolonged oral supplementation with L-arginine on blood pressure and nitric oxide synthesis in preeclampsia. E J Clin Invest 2005; 35:32-37. Yeramilli M, Yeramilli M, Obare E, et al. Prognostic value of symmetric dimethylarginine to creatinine ratio in dogs and cats with chronic kidney disease. Proc ACVIM Forum, 2015. acvim.org, accessed 2015. Gregory F. Grauer, DVM, MS, Diplomate ACVIM (Small Animal Internal Medicine), is a professor and the Jarvis Chair of Medicine in the Department of Clinical Sciences at Kansas State University College of Veterinary Medicine. Dr. Grauer’s clinical and research interests involve the small animal urinary system, and he is on the board of directors of the IRIS and American Society of Veterinary Nephrology and Urology. Dr. Grauer received his postgraduate training in internal medicine at Colorado State University. He has been a faculty member at University of Wisconsin School of Veterinary Medicine and Colorado State University College of Veterinary Medicine.